Different soil textures, proximity to building foundations, toe and heal hillsides locations, subsoil strata composition, seismic zone proximity, hydro-static water conditions and a host of other site specific conditions may exist. 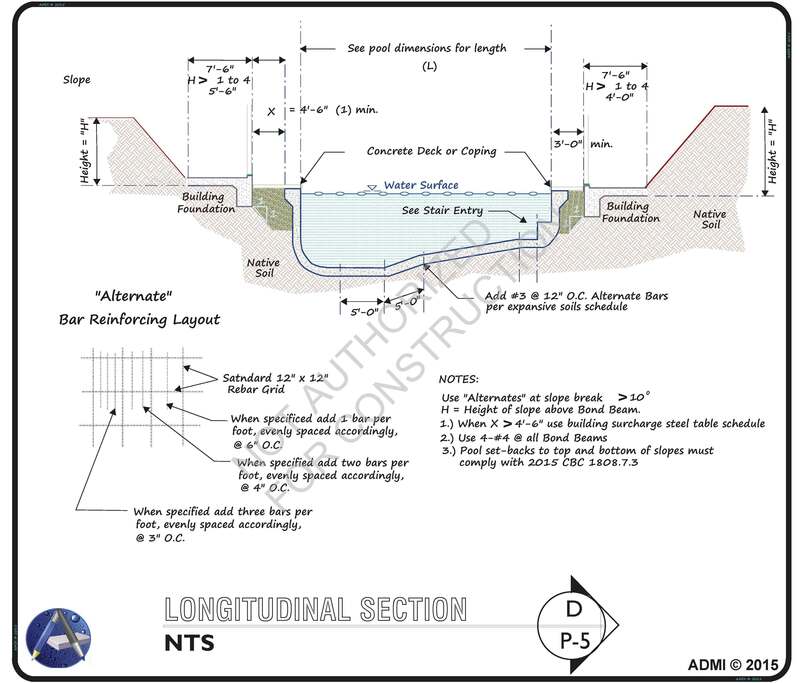 A essential component to swimming pool design can involve reviewing the results of Geotechnical findings (test borings, soil sampling, etc. ), which in turn will direct the prescribed remedy for directing the Structural Engineering applications. 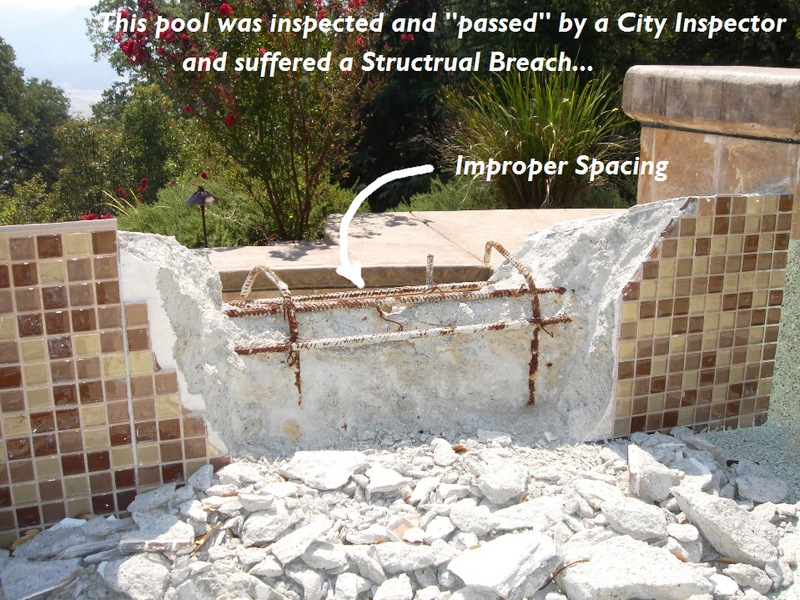 A swimming pool’s structural intent must collaborate with the approach and application of principled geotechnical science, in order to provide the anticipatable level of reinforced structural integrity. A common approach is to employ a “Standard Boiler Plate Steel Schedule” in providing the directions for the swimming pool’s steel reinforcement spacing, sizing, gunite wall thickness, etc.. In a Boiler Plate approach,…hypothetical calculations are inferred to rather than assigned to explicit site specific conditions. 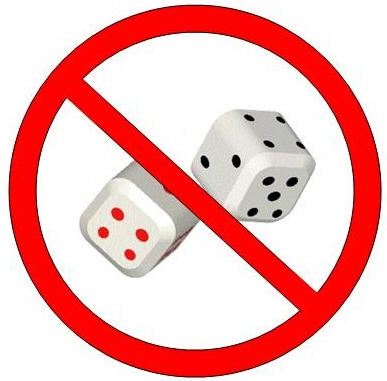 Therefore, certain unknowns may not be addressed as part of this approach. Overall, this approach may be adequate in providing structural integrity but, absent the Engineer of Record’s (EOR) site specific on-site verification that these standards have been authenticated as being applicable to your project, you lose the benefit of those second set of eyes! Hillsides and other unique building locations can pose problematic conditions that need to be addressed. The Structural Engineer is in charge of providing directions for a principled approach for the conditional pool shell’s sustainable stability. The structural prescriptions for a swimming pool are an evaluation for the conditions that exist and by performing calculations that can assumed a conditional awareness for such stresses and loads that may exert pressures on the pool’s shell a remedy can be substantiated under such conditions. 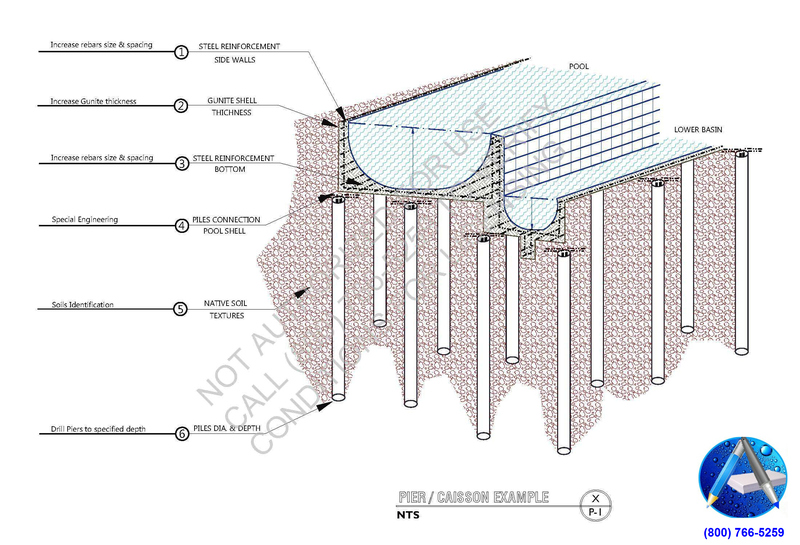 In such cases, in-field observations during the construction process are a mandated prerequisite by building officials, as the (Engineer of Record (EOR) must provide a visual verification that the prescribed steel reinforcement placement’s have been placed appropriately prior to gunite applications. In-field observations during the construction process even when utilizing a Boiler Plate Steel Reinforcement Schedule” may also be well advised, as the assumptions being made can turn out to be inadequate. DRAG & DROP A SIMPLE SKETCH OF YOUR POOL IDEAS HERE. A GENERAL OVERVIEW OF THE PROPOSED POOL'S PLACEMENT. SELECT ANY SPECIFICS THAN MAY PERTAIN. Percentage % refers to a 1:100 ratio. As an example 2% means that the surface slope of the adjacent ground would equate to a 2'-0" difference in elevation over a 100' span in distance. Is there ground water evident in excavations?